To be honest, I joined the slow grow out of a fear of missing out. Most club members had signed up and it seemed unlikely that I’d have anyone to play anything else with for a while if I opted out. Despite this reticence, I really enjoyed the game and the league. I was also chuffed to have some painted models at the end of it, as it had been a long time since I’d properly painted anything. 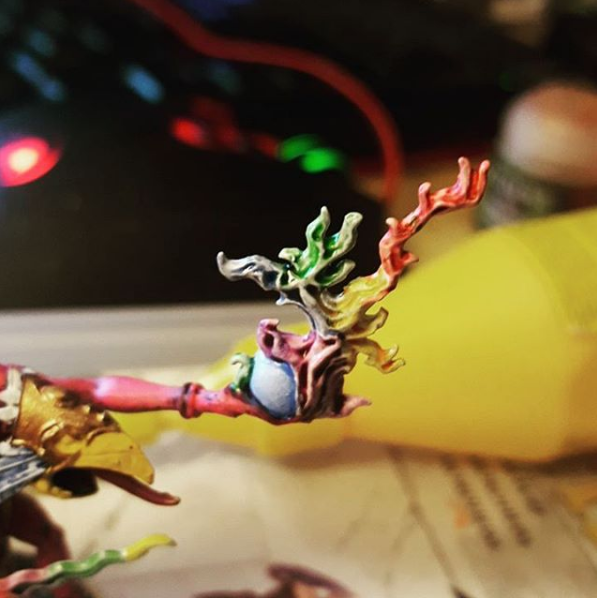 It was a lot of fun and, after being so sceptical of the original release of Age of Sigmar, I was really impressed with the direction they were taking their new game in. 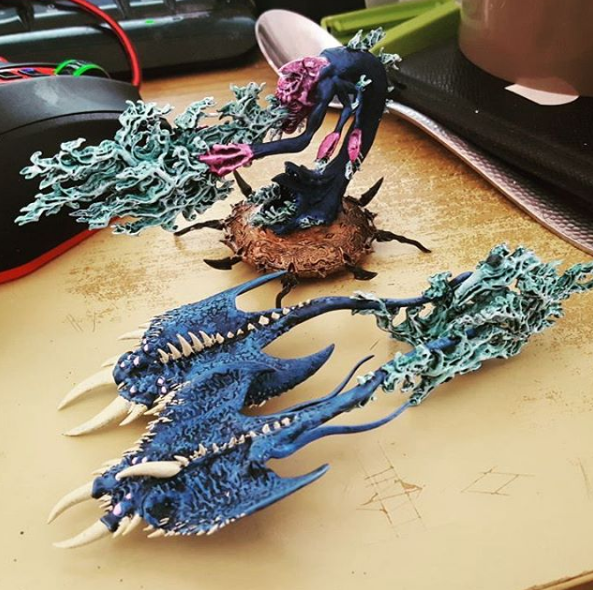 In the past year, I’ve played more AoS than in the last four or five years of Warhammer. That’s a pity, but it’s true. I still love the stories and flavour of the Old World, but I’m also now loving the new, sword and sorcery feel of Age of Sigmar. I’m also loving the creativity and style of the new armies they bring out. It’s won me over. Although it was not one the of GW games that I was really into back in the day, the return of Necromunda was likewise, a big plus for me, and I picked up the Underhive set. I’m very much looking forward to getting that to the table in the near future. My only complaint on that front is that I really liked the idea of Shadow War: Armageddon, which came out a few months before the revamped Necromunda. It’s a pity that the game seems to no longer be supported, but at least we have the very heavily supported Necromunda to play instead. Then we turn to Warhammer 40,000. Most of my time playing 40K was in 3rd edition, usually with my Chaos Space Marines or, originally, my Eldar. I kind of fell away from 40K for a while after that, returning briefly with some Grey Knights for an event in 5th Edition, back in 2011. I think I played a total of 2 games across 6th and 7th editions, neither of which I had particularly enjoyed… then 8th edition dropped and the prospect of another club slow grow. 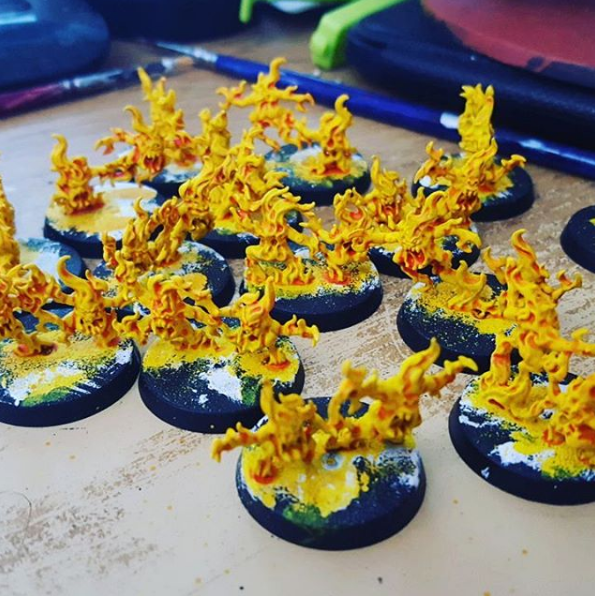 I initially felt the same way as I did about Age of Sigmar, but perhaps with a bit more positivity, based on my previous experience with one of these leagues. I deliberated for a while over what army to use. Orks were a strong possibility, but I ended up going for a safe choice – Chaos Daemons. My thinking was that if I ended up not enjoying the game, at least I’d have an army I could use in Age of Sigmar, which I love. 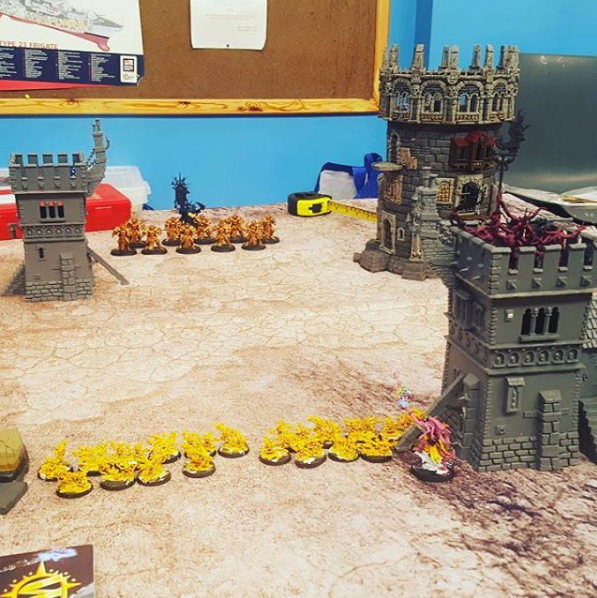 My first game of 8th edition 40K was a lot of fun. Since then, I returned to my parents’ house and dug a big red box out of the garage. In the box was a job lot of Daemons, picked up cheap several years ago. 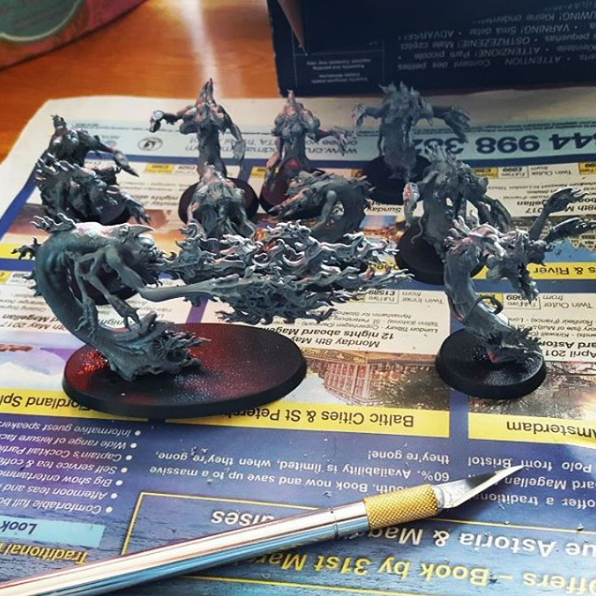 I brought them home, counted out the 40 Pink Horrors in the set, spent considerable time cutting off bits of sprue that the previous owner had left on then, even after they were painted, filing down globs of glue and removing old, square bases in favour of new, round ones. They’ve since been sprayed a lovely, bright pink and taken to the club last weekend for some preparatory games. I’m looking forward to the league but, more than that, I’m delighted to be enjoying a part of the hobby that I’d kind of given up on. It’s great to have Games Workshop back, putting out games that I enjoy. It’s great to have cool articles in White Dwarf, including alternate rules and other interesting tidbits. It’s great to have painting videos and community engagements again. It’s also great that with GW’s new attiude, has come a sharp uptick in their share prices. It’s nice that they’re being rewarded for their good behaviour. To finish up, I just want to say that the Games Workshop of today is more like the GW of the late 90s/early 2000s that I grew up with and that is great. 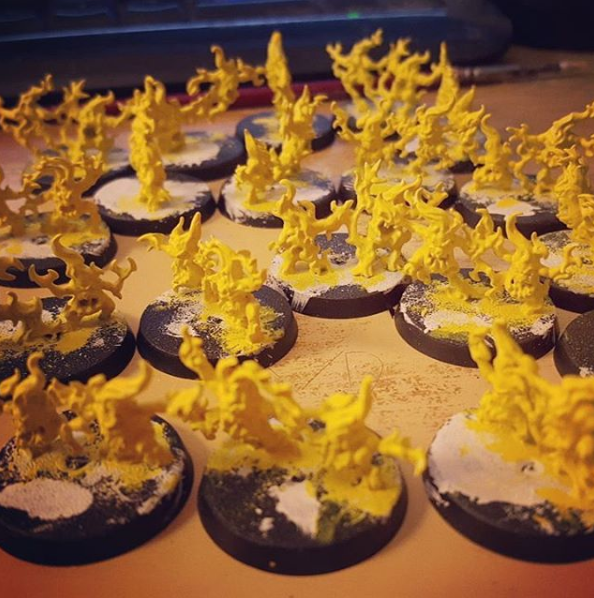 I feel that the change in attitude from the company comes across to customers and every release of the past couple of years has been genuinely interesting and tempting – especially the new AoS armies. Bravo GW. You’ve won me back, and I know I’m not the only one. It seems to me like their Specialists Games team has been working really hard. Even to correct earlier mistakes on the rereleases of these games. Since I’m more into those games than the main GW games, I’ve really appreciated that. Also with Blood Bowl, even though changes have come about, it’s still really the same old game for those who never want the game to change.